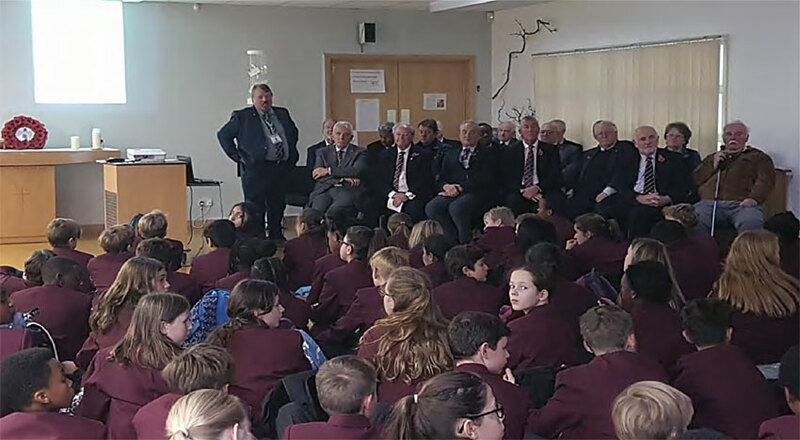 On Friday 10th November, 18 Old Wandsworthians attended St Cecilia’s School for the annual remembrance service and the laying of a Poppy Wreath. Before the main event we were invited to lunch in the refectory with Deputy Head Teacher Ann Kennedy. Here many of us felt like we were back as school, because as we sat down, in came hundreds of pupils in their maroon blazers! Following lunch a small group was then shown around the school, where a few started to go down memory lane! This was lead by their Head boy – Liam Warner and Head Girl, Holly Huntrods. As in the past we all found ourselves explaining to these two pupils our memories of what the school looked like in our days! We were then all taken to the school chapel and seated for the start of the remembrance service. The service was opened by James who explained to the year 7 pupils what the service was all about. This was followed by a presentation from Trustee, Les Herbert, on the history of the OWMT. He also explained that since the plaque was unveiled back in 2015, we have started to find out more information on some of the names. 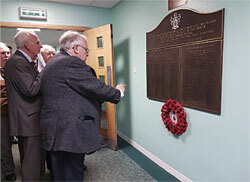 Also showing them recent photograph of the war medals which were sent to us last year. This was followed by an open session asking the students if they had any questions! Like last year, we had several very interesting questions from them. And as before, a few of these were answered by our senior members Peter Eastwood and Peter Heard, who were both young children near the end of WW2 and were at the school in the late forties. Questions, like what was it like in London during the war and was it scary? Needless to say, they both spoke about the doodlebug flying bomb and the noise and the Anderson air raid shelters!! Following this presentation a small procession took place, where two year 7 pupils (Archie Naples and Lily Andrews) carried the wreath to the War Memorial Plaque, followed by all Old Wandsworthians and Revd. Annie Kurk. Here a short service was held, which was shown back in the school chapel, watched by over by120 staff and pupils. 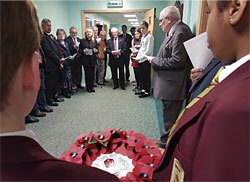 The wreath was then laid by Peter Eastwood and the two year 7 pupils, followed by a minute’s silence. Once again we had the chilling part when the Last Post was played by a pupil Hector Price in Year 10. After the service we all went into the refectory where we were joined by prefects and year 13s for refreshments. Here many of us mixed with the pupils talking about many topics ranging from our old School Wandsworth, our backgrounds, their futures, Universities, how good their school was and many more. We all found this a very important part of the day at St Cecilias. Next year will be the 100th anniversary of the end of World War One, and we will be arranging a special service, which will be lead by the Bishop of Kingston. Please place this date in your diary Friday 9th November 2018. St Cecilia’s School. Further details will be sent out nearer the time, but it will probably start at 2-30, followed by refreshments and time for us all to catch up.